to dance like it’s 1984, but still reflect a social consciousness of 2009? The British duo will release their 10th studio album on April 21 in the United States through Astralwerks. ‘Yes’ has been out in the United Kingdom through Parlophone/EMI since March 23, and entered the Billboard UK albums chart at No. 4. For ‘Yes,’ the Pet Shop Boys worked with Xenomania, a production group known for collaborating with Cher and other pop stars. Xenomania co-wrote three of the tracks on ‘Yes’ with Lowe and vocalist Neil Tennant, who write most of their own songs. The Pet Shop Boys, who recently won an award for outstanding contribution to music at the 2009 BRIT Awards, ‘felt very much at home’ at the house outside London, England, that Xenomania has devoted entirely to music, Tennant said. Every bedroom has a studio, and bands hang around downstairs waiting to record amid the sounds of instruments, record mixing and talking. ‘You can hear this cacophony of music all day long,’ he said. Like a vinyl record, ‘Yes’ is divided into two distinct halves: the happy pop introduction and the more ‘weird’ experimental conclusion, Tennant said. The album also features guitar performances by Johnny Marr. ‘Love, etc.’, the album’s first track and currently No. 2 on the Billboard Hot Dance Singles Sales chart, is a social statement about how money, shopping and celebrity don’t necessarily bring happiness, while the third track, ‘Beautiful People,’ imagines that it must be great to have wealth and fame, Tennant said. ‘Pandemonium,’ a love song inspired by the relationship between actress Kate Moss and singer Pete Doherty, was originally written for Kylie Minogue to sing, but she didn’t use it, Tennant said. Media reports that they’ll never work together again are incorrect, however, he said. Perhaps the most out-of-character song stylistically is the finale, ‘Legacy,’ a meditation on politicians leaving office (‘You’ll get over it’ is the main message). Tennant identified it as his favorite because of the poetry and the mystery in the music — ‘it continues to fascinate me,’ he said. With all this talk of love, Tennant is private about his own love life. As far as love in the album goes, though, ‘Some of it’s real, and some imagination; some of it’s memory,’ he said. The duo did not meet in a pet shop, but in an an electronics shop in London in 1981. Tennant needed a piece of equipment for his synthesizer and, when he and Lowe started talking about music, the two hit it off. They started making music as a hobby with an acoustic guitar and a synthesizer, and played drums by banging on the table, Lowe said. ‘It’s all been a gradual process really. We never sat down really and said, ‘Let’s become pop stars,’ ‘ Lowe said. When they first recorded ‘West End Girls’ together, the musical group did not have a name, Tennant said. They took the name Pet Shop Boys because they had friends who worked at a pet shop in West London known as the ‘pet shop boys.’ They thought the name fit with popular rap groups such as the Beastie Boys. ‘It has actually no meaning whatsoever. Chris used to be embarrassed by it,’ Tennant said. 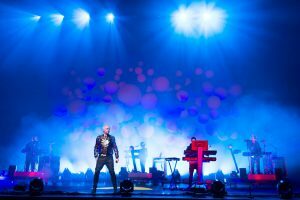 While influenced by hip-hop, electronic disco, and other genres from the beginning, the Pet Shop Boys have always emphasized the songs themselves, Lowe said, and they’re not ‘purist’ about what kinds of instruments get used. In the beginning, they sampled everything from animal noises to broken glass for their songs. They even recorded the sound of a woman walking down a street in high heels for ‘West End Girls,’ and the ambience of a cathedral for the 1987 single ‘It’s a Sin,’ Lowe said. Their songwriting has perhaps gotten more sophisticated and experimental over time, Tennant said. ‘In the ’80s I never sang any harmonies on records. Now I do loads of harmonies. I’m turning into Brian Wilson!’ Tennant said. ‘Yes’ continues the Pet Shop Boys’ tradition of having one-word titles for albums, such as ‘Please,’ ‘Bilingual,’ and the more recent ‘Fundamental.’ The convention just developed and became a style that the duo decided to keep, Tennant said. ‘It’s like e.e. cummings not having any capital letters — it’s a signature thing,’ Tennant said. The duo is determined to branch into new areas. Lowe and Tennant’s next project is a ballet slated for 2011 based on a story by Hans Christian Anderson. Tennant said it is instrumental, and includes a mixture of electronic music and strings. ‘The challenge of telling a story through music and dance is something that we’re interested in,’ Lowe said. Plans to tour the United States in the fall are under discussion, the duo said.